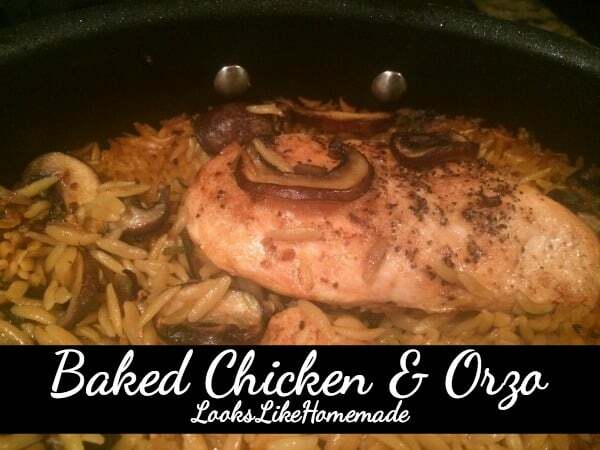 I found a baked chicken & orzo recipe on Pinterest and adapted it for my family. The recipe I found was HUGE, so i cut it down for 4. Its simple and 1 pan. Orzo is a great alternative to rice, cooks up nice and takes on flavor just like any pasta. The original recipe called for way more butter than I used, and way more sage. I like just a hint – you could totally substitute dried sage for the fresh if you didnt want to buy a whole package to only use 2 leaves. Fast, Yummy, Easy. 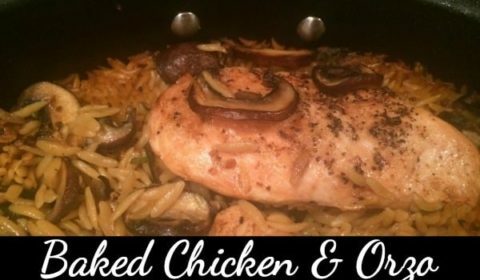 Great for a quick dinner or for company! Melt final 2 Tbsp Butter in skillet, add in onion, mushrooms and garlic. Saute until mushrooms start to wilt. Add in Orzo and coat with butter in pan until the pasta turns slightly brown and toasty.